The center-right government easily returns to power. Can it continue its impressive economic performance? 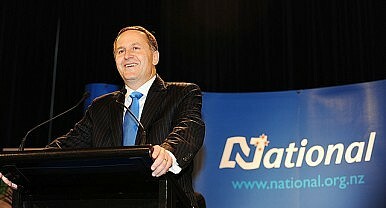 New Zealand’s “rock star economy” helped center-right Prime Minister John Key achieve a thumping election victory. But with major trading partner China slowing, are financial market celebrations premature? The New Zealand dollar, government bonds, and stocks gained after Key’s National Party romped to power in Saturday’s poll, securing its third straight term and the nation’s first majority government since proportional representation was introduced in 1996. Despite “dirty politics” claims and a late attempted campaign ambush by internet entrepreneur Kim Dotcom, the incumbent National Party won 61 of 121 parliamentary seats and 48.1 percent of the vote, the party’s best result since 1951. In contrast, the main opposition left-leaning Labour Party, which pledged an expansion of government, secured only 24.7 percent of the vote for its worst performance since 1922. The Greens won 10 percent and New Zealand First 8.9 percent as pre-election predictions of a closer race proved false. Key pledged to maintain strategic alliances with the Maori, ACT and United Future parties, which won four seats between them, further strengthening his parliamentary majority. The “kiwi” currency appreciated 0.2 percent, the stockmarket posted its biggest jump since April and bond yields fell Monday as financial markets welcomed the prospect of more tax cuts and pro-business reforms. Despite his background as a former currency trader with a reported personal wealth of NZ$50 million ($40 million), Key’s “easy-going style” has helped him maintain the highest poll ratings among Western leaders, rivaled only by Germany’s Angela Merkel. While rugby-mad New Zealand has basked in the success of its national team, Key’s economic management has earned admiration from analysts in neighboring Australia, which previously dominated in the business arena. Paul Bloxham, HSBC’s chief economist for Australia and New Zealand, has called New Zealand “the rock star economy in 2014” for its success in outpacing most of its developed peers, predicting 3.4 percent GDP growth this year. The economy has been aided by reconstruction spending in the earthquake-hit Canterbury, a housing boom powered by low interest rates and growing immigration, and a surge in dairy exports to China on the back of a free-trade deal signed in 2008. New Zealand’s economy expanded at an annualized rate of 3.9 percent in the year through June, its fastest pace in a decade, despite being the first Western economy to hike interest rates. Unemployment has dropped to a five-year low, while Finance Minister Bill English has pledged to deliver the nation’s first budget surplus in seven years. “Like [Australian Prime Minister] Abbott, Key as a new prime minister inherited a budget and an economy in deep trouble…Six years later, the budget is in surplus, unemployment at 5.6 percent is falling and the economy is growing so strongly the New Zealand Reserve Bank became the first among developed countries to raise interest rates to deter inflation,” noted the Australian Financial Review’s Jennifer Hewett. “Not only did the Key government cut personal and corporate tax rates, it raised the goods and services tax to 15 percent while steadily reducing government spending over years of ‘zero budgets,’” wrote Hewett, who urged Abbott to “learn some sharp lessons” from Key’s electoral successes. Key’s party has pledged to cut government debt to 20 percent of gross domestic product (GDP), reduce taxes “when there is room to do so” and create more jobs, aiming to undertake further labor and regulatory reforms as well as boosting the supply of housing. However, the picture is far from perfect for the nation of 4.5 million, with a plunge in export prices along with an overvalued currency and housing market “bubble.” Dairy prices have dropped around 40 percent this year, with the key export hit by oversupply in China and Russia’s ban on European Union imports. New Zealand’s central bank has forecast a slowdown to below 3 percent GDP growth in 2015 as softer commodity prices hit incomes, while it has increased official interest rates three times in an attempt to curb property overinvestment. “New Zealand’s extraordinary outperformance in recent times is behind us,” Morgan Stanley analyst Sung Woen Kang said in a research note, citing both domestic and overseas headwinds including an “elevated” exchange rate, negative dairy prices and cooling housing market. Forbes contributor Jesse Colombo has claimed a crash is on the horizon, citing the effects of the housing bubble and the banks’ exposure to a potential slowdown. “Agriculture accounts for only 5.1 percent of New Zealand’s GDP, while the finance, insurance and business services sector is the country’s largest sector, contributing 28.8 percent to the GDP. Furthermore, banks account for 80 percent of the total assets of New Zealand’s financial system. Not only is New Zealand’s banking system dangerously exposed to the country’s property and credit bubble, but so is the entire economy,” he claimed. According to Colombo, a wave of property investment from Chinese and Australian buyers has exacerbated the housing boom, with any slowdown in such economies increasing the risk of a crash. Yet while New Zealand Treasury Secretary Gabriel Makhlouf has admitted the nation’s economy is slowing, he said it was far from reaching a crisis. “We’re forecasting that [economic growth] will taper off a bit but we certainly want to move from being described as a ‘rock star economy’…to being a ‘rock solid’ economy,” he told CNBC. For the rest of the region, achieving “rock solid” status with declining unemployment and public debt would be a major achievement in itself, let alone being a rock star.